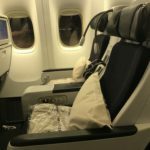 "hard narrow and most uncomfortable"
Flight from Paris to Hong Kong. The seats were hard narrow and most uncomfortable even for a short flight 12 hours was torture!! CDG-MEX seat 53K. It's in the narrower part of the aircraft at the rear so there are only 2 seats instead of 3 on the windows side. IFE box was under the seat in front of me but to I was not too bothered by it. The seat is away from the cabin wall and this gives you several windows and a sensation of space. You get your own storage space between the seat and the wall which can also serve as a table. Although it will be shared with the person behind you. Getting things in and out of it means removing anything sitting on top. The IFE was okay selection of programs was fair. However to select anything on the screen you had to press hard which makes you shake the seat in front of you. I had to endure that from the lady behind me. Food and drink service was very good for Economy. 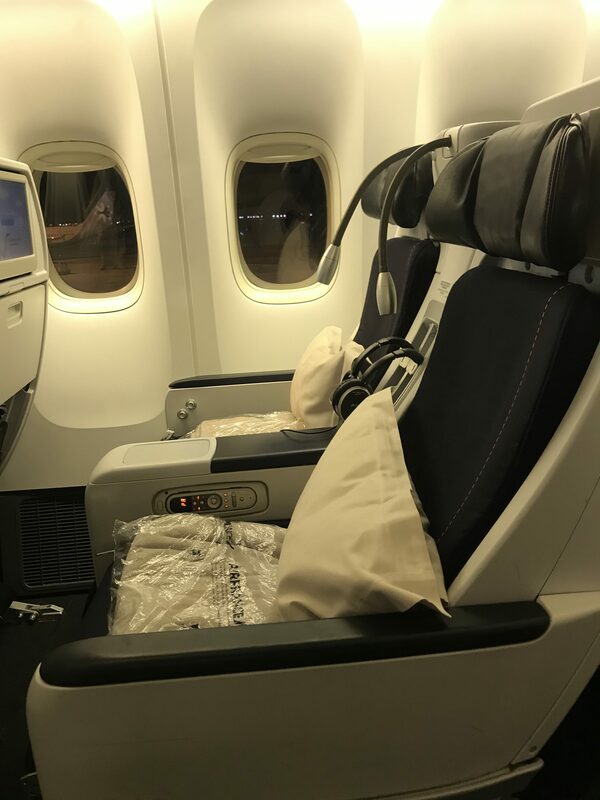 Air France Premium Economy. Downside a bit expensive upgrade no toilets but they didn't seem to object to us using first class toilets. Those who put down these seats have not sat in Air France economy - which is horrible. I am only 5'6" but the economy seats have no padding. "seats barely reclined at all"
I traveled in the lower-level economy cabin in the last row of the cabin. The seats barely reclined at all. I complained to the hostess as this was an overnight transatlantic flight. She informed me that all seats in the economy cabin had the same pitch. Needless to say I spent a very uncomfortable night. 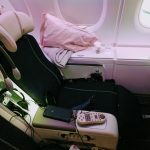 "do not believe the hype"
We paid a lot to travel Voyageur class which is Air France's version of Premium Economy. Do not believe the video on the AF website and do not believe the hype. 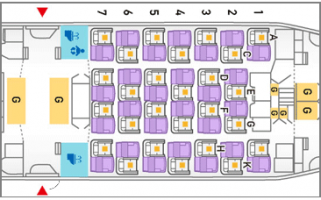 The seats are narrow and have been designed so badly that you have no chance of a restful flight. You just slide down and your knees bang into the seat in front. You get plastic cutlery and cups and same food as economy. Do not pay for this class of fare. There is very little difference to their AF economy class. The service is the same non-existent. Makes me ashamed to hold a French passport. Never again. 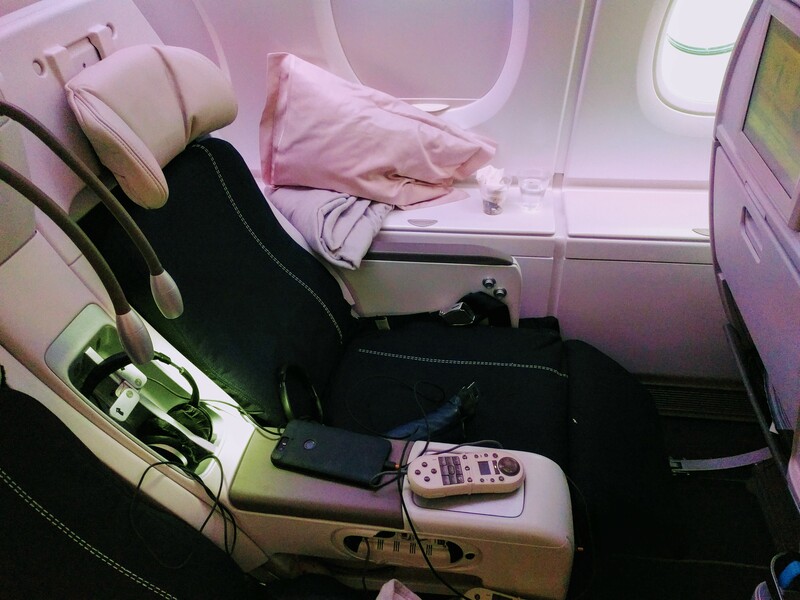 "to me it was torture"
Flew AF economy HK to Paris. Never again! I'm not a small person at 6ft tall and 120kg and to me it was torture. I never got comfortable in all 13 hours 40 minutes of flying. Very narrow seat poor recline and 2 empty seats next to me I could not take advantage of because the armrests were fixed! The TV was quite blurry too. "this seat was so narrow"
I literally thought it was a joke - that's how uncomfortable this seat (and hence the entire trip) was. I'm not exactly skinny but neither am I obese yet this seat was so narrow it cut off circulation to my thighs. To make matters worse my shoulders and upper arms kept bumping up against the passenger to my right (I was in an aisle seat) to the point where I finally had to get up and pace around the plane to relieve the discomfort. Throughout the entire trip from Miami to Paris I was lucky if I was able to sleep for 20 minutes. I arrived at my destination in the Middle East feeling like I'd been run over by a truck. AF seats narrow and hard and it was very difficult to get comfortable. Also I have short legs and the absence of a footrest is a real problem - I had to place cushions on the floor & place my feet on them to ensure adequate circulation in my legs. My impression from 6 SIN-CDG legs is that the planes need a cabin refit with more comfortable seats. On the other hand I would rate AF ahead of Qantas's mediocre international economy offerings. I flew in the A380 going from CDG to IAD and then came back in the A330 ORD to CDG. The 380 seat was spacious with a large screen while the A330 was cramped and had the tiniest of screens. I gave such a poor rating for the recline due to when the person reclines completely in front you can't eat easily get out of your seat see the TV screen very well or feel like you can breathe. I didn't feel comfortable putting my seat all way back in consideration of the person behind. The seats also lead to people behind pulling on your seat when they try and get up and down from these cramped positions. I will try and avoid this aircraft in the future on AF.